Richard Hannon's father Richard snr became synonymous with the Weatherbys Super Sprint thanks to his record seven wins in the feature five-furlong contest for two-year-olds and Hannon jnr gained his second victory in the unique race with 16/1 chance Ginger Nut, who was backed in from 25/1 and emerged from stall 19. The winning time was 1m 1.85s on turf described as Good to Firm. The Sir Prancealot filly, part-owned by Hannon alongside long-standing patrons Chris and Jenny Powell, was held up towards the rear of the maximum 25 runners by Harry Bentley and ran on strongly between runners to take the lead entering the final half-furlong. Ginger Nut, who cost £23,000 as a yearling and therefore received a low weight, ran on well to beat 50/1 outsider Moojim (Bryan Smart/Graham Lee, drawn 22) by a neck, with 9/2 joint-favourite Kinks (Mick Channon/Joe Fanning, drawn 10) finishing a half-length back in third after a troubled passage. 25/1 chance On The Stage (Ed Walker/Luke Morris, drawn 23) finished a further next back in fourth, while 9/2 joint favourite and top-weight Little Kim (Karl Burke/Ben Curtis, 16) never threatened and came home 14th. 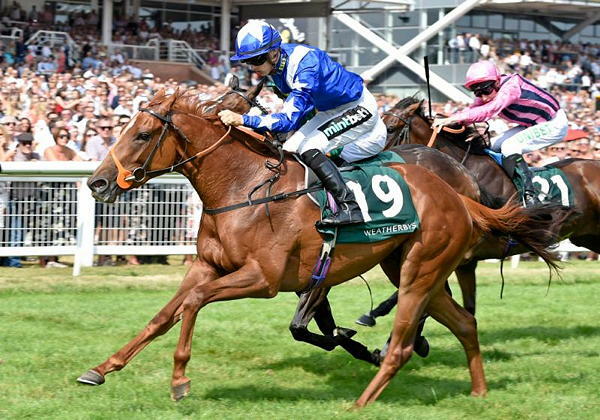 Hannon, who sent out European champion two-year-old filly Tiggy Wiggy to win the 2014 Weatherbys Super Sprint, said: "We were a little disappointed with Ginger Nut on the first few times she went to the races, when she went off a little bit too quick, but we tucked her in today. "This was the plan from the moment we bought her. She didn't have an owner, so Chris and Jenny came in and I said that she would be an ideal filly for the Weatherbys Super Sprint. "I said that I would probably have a quarter-share and, the next thing I knew, Chris had put me down for a half-share, so it has backfired big-time on him! "It's great for Chris and Jenny, who are big supporters of ours and have horses with a lot of trainers. They are good investors and good people, which is what this race is all about. They have had their payday with a lovely, fast filly and it has all gone well." Harry Bentley commented: "I am really, really pleased with Ginger Nut. She has dug deep and travelled really well for me. It is very tactical in these sort of races and getting a run is of the utmost importance, but we got a nice run through and she did it well. "Any jockey would agree that luck plays a massive importance in these races - things have to pan out and the gaps have to open. Luckily, I was following the right horses and we got there when it mattered." Run over five furlongs and inaugurated in 1991, the Weatherbys Super Sprint is an innovative race for two-year-olds who were sold or bought in as yearlings by public auction at 'specified sales', or as two-year-olds up to and including March 6, 2017, for £60,000 or less before July 1, 2016, or for £63,000 or less after June 30, 2016. For each £5,000 paid under £63,000, horses are given a 1lb allowance (the last sale to govern the price if sold more than once). Colts and geldings are set 9st 3lb before any allowance and fillies 8st 12lb. The following penalties apply: a winner of a Class 2 race 3lb, of a Listed race 5lb and of a Pattern race 8lb.